The best part of being in a writing group: celebrating publication. In yesterday’s post, members of my writing group responded to my question: What do they get from being part of a critique group? Three answers ran yesterday, and three more follow. Amy Kortuem. Amy’s a singer and harpist who writes her own material. You can find her CDs and performance schedule at her web site. She writes professionally and recently decided to bring her own writing into the world. Look for her to publish soon. Also, Amy has the world’s best biceps from carrying her massive harp to gigs. Who needs weights? I think what I love most is the companionship of people who are doing what I’m doing. I don’t have any harp friends, and have done everything in the space of my own head and heart. But in writing, I NEED companionship. I need to talk through ideas before I write. I need to read what others are writing and see that in all stages of drafting so I don’t put all that stupid pressure on myself to hang out with one paragraph for two weeks until it’s “good enough” before moving on. With writing, it’s hard to let anyone read something until I’m in a place where I think it hangs together. Maybe once I get used to the welcoming atmosphere and the genuine support of this group, I’ll be able to share more. 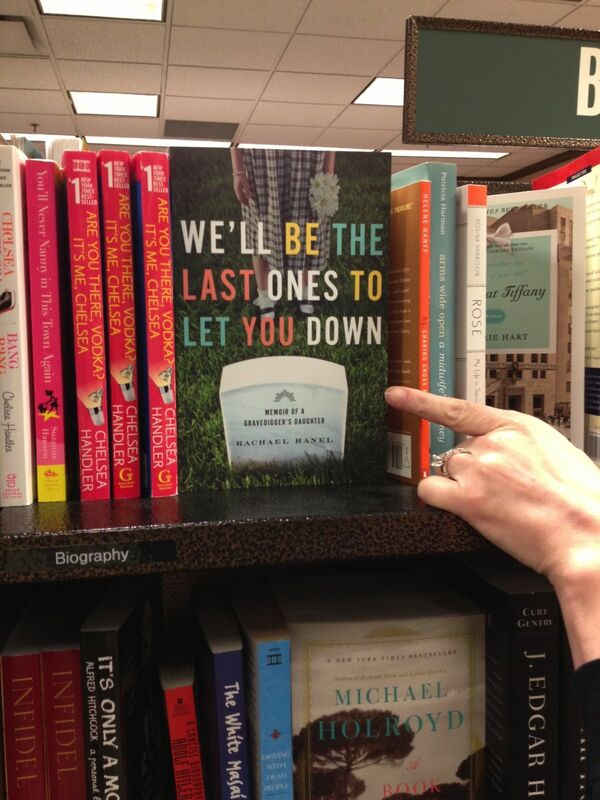 Rachael Hanel is the author of the memoir We’ll Be the Last Ones to Let You Down and an essayist. We worked together for six years at a newspaper. That’s where I discovered we shared so much – and so little – in common. Rachael loves winter, enjoys cemeteries, and is devoted to working out. Me? Not so much. I need sets of eyes on my new work. You absolutely need to bounce work off others. Sharing resources: magazine articles, books on writing, notes from workshops and conferences, tips we’ve learned, etc. A group in which to brainstorm ideas. Judith Angelique “Angie” Johnson is a published poet who also writes essays and fiction. Alas, we’ve been unable to bring Angie into the technical world, so there’s no web site or Facebook page. Angie looks sweet and fragile, but don’t let that fool you. She once hopped in her minivan and chased down a man who’d stolen a bike from her driveway. She raced down the street, yelling “drop the bike, mother****** or I’ll run you over.” And the guy, wisely, dropped the bike. The group gives me confidence. I like criticism to see where I can improve as a writer and a thinker. The group keeps me balanced: to love the sound of words, but to love – even more – their meanings. Story first. Providing criticism for others has also made me a stronger writer. It forces me to think about audience, purpose, stance and so on, in order to provide feedback that is helpful for others, rather than feedback on how “Angie would do it.” I also know my writing can fall flat on its face and I won’t be judged. Our group is a safe place to fail, and fail hard, and then stand and tighten the belt again. So there you have it. Six members; six viewpoints. Tomorrow: what your writing group should not be. This entry was posted in Authors, Inspiration, The writing life, Uncategorized, Writing Tips and tagged Amy Kortuem, Judith Angelique Johnson, Rachael Hanel, We'll Be the Last Ones to Let You Down on August 27, 2013 by Shelley Tougas.